THE PERFECT PIECE TO BRING NEW LIFE TO AN OLD TRADITION!! 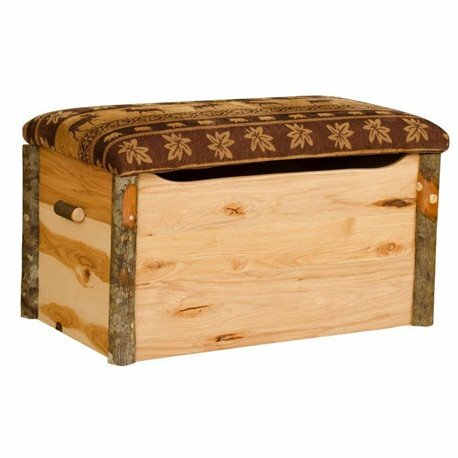 This blanket chest has a cushioned top with your choice of of fabrics! It's a perfect addition to the foot of any bed or a great accent piece in any living area. The front of this chest is blank which leaves room do add your own creative accents! Add a family name or a special date to make this chest an heirloom piece that will follow through the generations of your family! Would you like a Lift Gate on your Order? When ordering from FURNITURE BARN USA you can be sure that you are getting Quality, Amish, Handcrafted, made in the USA products that are made to be durable and last for a long time. Bring the natural beauty of solid Hickory logs to your home. Each piece is custom made in the USA by skilled Amish craftsmen. Solid wood options available include All Hickory or Hickory and Oak. Either option is a great choice for a piece which is sure to last for ages. A great decor style for a rustic log cabin, mountain lodge, or country house.